When your debut film is Get Out, people are going to be clamoring for the follow-up. Tickets are available, the line begins just over there. Lupita Nyong’o gives a stunning performance, leading an ensemble through Peele’s treacherous world of twists, turns, and murderous doppelgängers. Rich with symbolism and delivering astute social observations on the human experience, Us is a dizzying whirlwind of thoughts, ideas, and terror. Let’s set the record straight: Get Out and Us are different films. If you want another Get Out, this ain’t that. Some viewers may find Peele becoming a bit unwieldy when it comes to mixing social commentary, humor, pop culture references, and all the rest. For me, the film’s biggest issues come with a few gaps in logic that are hard to talk around and/or ignore. Us is clever, intriguing, intense, and surprising - but it is also very much a horror film that does not always give you a safe or comfortable out. If you’re not up for the challenge, probably best to just move along. Exploring vulnerability and pride are just two of the more powerful themes found crawling around underneath the surface of Jordan Peele’s Us, the Oscar-winning writer and director's second feature. A fascinating, percolating, cerebral horror film, Us is not afraid to buck conventions and show us an almost romanticized notion that vulnerability, and not pride and bravado, makes us stronger. Oftentimes, in a horror film, showing a vulnerable side means you get murdered, taken hostage, or need rescuing. Here it is something of a badge of honor. This dialectical viewpoint lies at the heart of what some may think is going to be just another scary movie with an awesome concept: A family on summer vacation becomes terrorized by a second family, dressed all in red, yet looks exactly like them. Peele never plays simple and easy, and by the end of Us, you will likely be breaking apart key scenes, thinking how various symbols and pop culture references from the 1980s and 1990s fit together, as well as hitting up your favorite music streaming platform for the hip-hop/rap song that plays multiple times throughout the film. The song is called “I Got 5 On It.” The artist is The Luniz. Yes, it still slaps some 23 years later. Us proves difficult to discuss because spoilers lurk at every turn. Principally, this is a story which originates in 1986 at a Santa Cruz, California beach side amusement park. A little girl, Adelaide (Madison Curry), is with her parents and wanders off while dad plays Whack-A-Mole and mother uses the restroom. Eventually, she will enter a House of Mirrors and her life will be changed forever. In present day, Adelaide (Lupita Nyong’o) is married to Gabe (Winston Duke), with two children - Zora and Jason (Shahadi Wright Joseph, Evan Alex) - and they are headed to a summer home near Santa Cruz. When Gabe insists that the family travel to a nearby beach, Adelaide resists when she realizes that this is the same beach from her youth. To share more ruins the surprises, twists, and diabolical tricks Peele has in store for you. Of course, they go to the beach and later, doppelgängers will ambush the family outside and inside their residence. Much will be explained, other things not so much. This is all part of the fun. Stay for the horror, the scares, and crackling intensity, but leave with a great many things to ponder, explore, and consider. Honestly, Us is going to rock some people’s worlds. Among the film’s twists and turns, and the aforementioned consideration of vulnerability every major character endures at some point, Peele also explores how human beings often create empty gestures or promises to placate ourselves and make us feel better about the struggles others are experiencing apart from us. There’s consideration given to how we process anger, fear, and compartmentalize our emotions until they eat us up from the inside. Peele explores jealousy, rage, and entitlement, as well as incorporating a distinct bible verse to create an ominous world with which his science-fiction/horror story can expand and grow. Anchoring the film, and making it something quite special is Nyong’o, absolutely incredible in her dual role as Adelaide and “Red” - the doppelgänger mother. The Oscar winning actor creates two wholly original, complex characters out of the same individual framework. Her range is breathtaking, as Adelaide fights through tears and a unquenchable inner desire to save her family at all costs, while “Red” is dangerous, unhinged, and speaks with a guttural diction that begins and ends in her throat. One scene in particular, where “Red” addresses Adelaide in an underground room, is easily one of the most unique and compelling monologues of recent memory. Peele remains tethered to the premise that doppelgängers may be more ubiquitous than we realize. And the exploration of these ideas does leave a few questions unanswered. Once one sits down and deconstructs his world-building, a few things do not quite add up. Still, surprises abound and satire is plentiful. The use of N.W.A.’s controversial 1980s hip-hop anthem “F*** Tha Police” is brilliantly incorporated into the film, as is a jab to a culture of laziness, where gadgets can be commanded to entertain us and make our lives easier. Suffice to say, Peele is covering a lot of ground here. The cinematography from Mike Gioulakis offers a plethora of unforgettable shots and images, while composer Michael Abels delivers a powerhouse score, even stripping down that Luniz hip-hop song to chilling effects later on in the film. Us is brave, bold, crazy, and compelling, featuring an astonishing performance by Lupita Nyong’o. Rest assured folks, Jordan Peele’s sophomore slump has easily been avoided and Us is destined to become that next film we investigate, search through, debate and discuss for a long, long time to come. 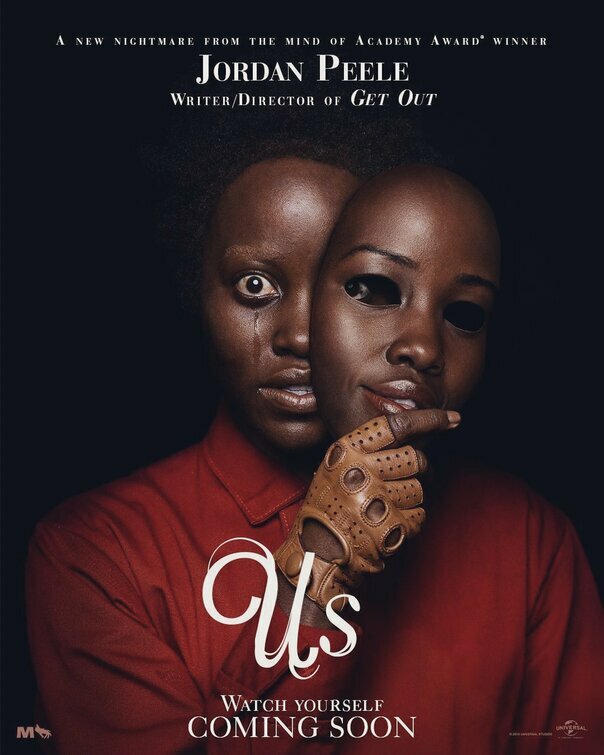 Starring: Lupita Nyong’o, Winston Duke, Elisabeth Moss, Tim Heidecker, Shahadi Wright Joseph, Evan Alex, Yahya Abdul-Mateen II, Anna Diop, Cali Sheldon, Noelle Sheldon, Madison Curry.